It is no secret that one of my favourite things to do is style a table. Selecting the menu, picking a colour theme, organising my glassware, crockery and napery - I love it all! I recently shared with you my love for collecting plates and napery, and to be perfectly honest, I can sit there forever and mix and match until I get the perfect combination of wares that match the food I am serving. It's crazy, but it's my thing! I love the idea of my guests feeling totally looked after when they come into my home, and when sitting to dine at a well planned table they can feel that. I put a lot of effort in and that makes my guests feel important. I always pick a theme and colour palette to start. For this outdoor Christmas table setting I wanted to create a simple, lady-like classic setting with the colour theme being baby blue and white. I wanted it to be crisp, fresh and elegant. From here I select my crockery - so much fun! I love opening those cupboards of mine to find the perfect plate. I am a sucker for gorgeous plates and it is no secret that I have too many! Using a large silver dinner plate as a placemat (yes, you can do that!) I teamed it up with a simple blue and white pinstripe napkin and a gorgeous dot edged everyday plate. You don't need to pull out your grandmother's finest to make an impression that lasts. I love teaming the old and new in pattern. It's all about balance. Having a good selection of white china in your collection is a must - it just matches back with everything. The silver is carried through with the cutlery and the bonbons add that Christmas feel to the table. Because who doesn't love a bit of sparkle? The centrepiece of my table is, of course, candles and flowers - my two favourite things and must haves in my home. My go-to flowers for this table are sweet pea, hydrangeas, green hybericin berries and some sprigs of mint to add more green. I love mixing something a little unexpected in my floral arrangements and herbs like mint, rosemary and thyme are perfect for this. Surrounding this selection of posies are a mix of beautiful candles. I've used 60g and and 250g vessel candles from Circa Home to create some levels of interest on the table. I am always looking for ways to create layers and height with simple items and scattering a selection of candles throughout the flowers creates this sense of elegance. To finish of my table was, of course, a little Christmas treat. y guests never leave empty handed and these little gift boxes wrapped in blue and white ribbon were the perfect plate topper. So as you can see, simplicity and elegance is key for this table setting. Surround yourself with friends, inhale the gorgeous smelling candles and flowers and have yourself a perfect Christmas lunch. 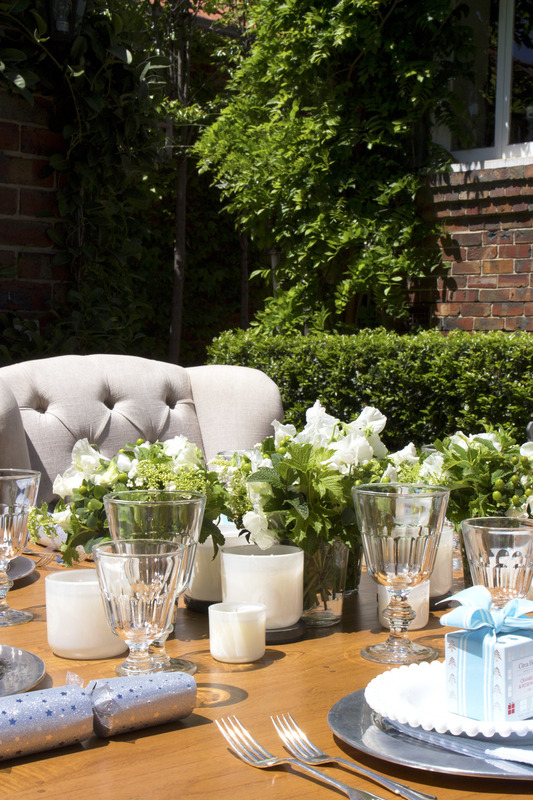 You too can create an inspiring and memorable Christmas table setting with Circa Home's Australian made soy candles, fragrance diffusers and gift sets. To view the collection visit Circa Home.